Charles Oakley scuffles with security guards. 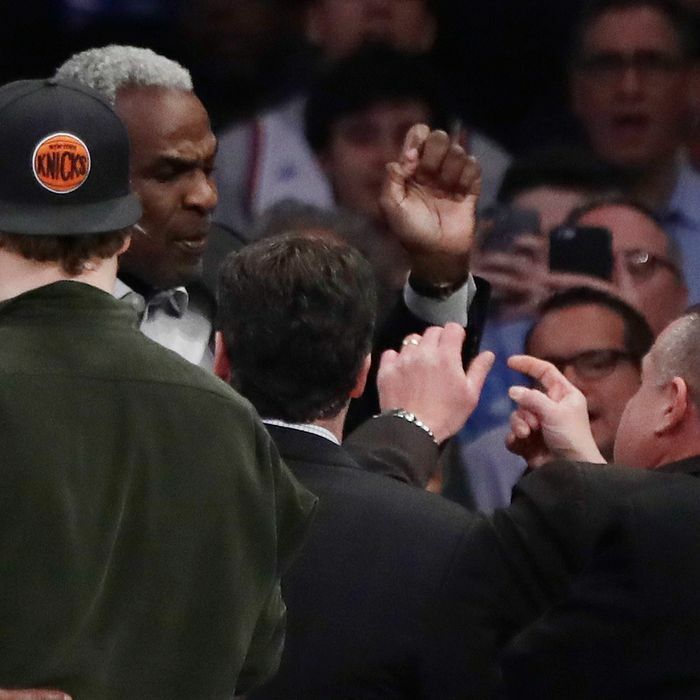 There was more trouble for the New York Knicks on Wednesday night when Charles Oakley, one of the team’s legends, was ejected from Madison Square Garden by five security guards and charged with assault. The incident occurred halfway through the first quarter of the Knicks game against the Los Angeles Clippers, which New York lost 119-115. Oakley was sitting courtside, several rows behind Knicks owner James Dolan, with whom he’s had a contentious relationship for years. Several spectators told the New York Times that Oakley seemed calm at the start of the game, and they didn’t see him interact with Dolan. However, the New York Daily News reports that Oakley was yelling at Dolan. Soon security guards swarmed around Oakley. Video shows Oakley shoving one of the guards as they try to remove him. Players stopped to watch the altercation, and the crowd chanted Oakley’s name as he was escorted out through a tunnel. Outside the court, Oakley shouted, “I didn’t do nothing,” as he was handcuffed and surrounded by guards. Knicks president Phil Jackson tried to calm him, to no avail. Oakley was charged with three counts of misdemeanor assault, and one of criminal trespass. He received a desk appearance ticket and was released from the Midtown South precinct around midnight. Oakley told the Daily News that he was asked to leave the game because Dolan didn’t want him there.